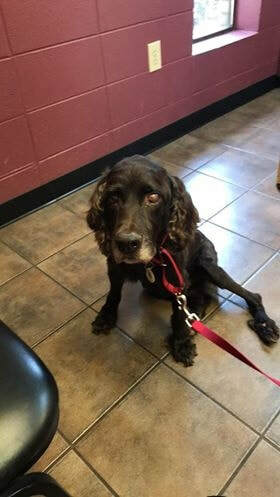 PFC Buddy - Boykin Spaniel Rescue, Inc. Buddy was a stray, taken in by BSR after the original finder could not carryout the extensive owner search we required to intake a stray. BSR carried out it's own search and was connected with the owner. However, due to changes in the family life and situation, Buddy was turned over to BSR so that he could be treated for his rather poor state of health. Besides being blind in one eye, Buddy had a large mass on one side of his shoulder and hip displaysia. He has become a sweet, well- mannered and joyous addition to his PFC foster family and their pack of other Boykins. And, he will live out his days in comfort and care as a BSR PFC foster.